Balassi Institute New York and ILIAD are proud to present the exhibition Reviving the Light: New Zsolnay Eosin Ceramics, featuring contemporary designs by a select group of Hungarian and American artists prepared at the Zsolnay porcelain factory in Pécs, Hungary. The exhibition opens on October 17, 2012 at ILIAD and will be on view until November 30. The Zsolnay Porcelain Manufacturing Company, founded in the 1850's, has been known to produce the finest in Hungarian ceramics, particularly during its "golden age" in the Art Nouveau and Secession periods at the turn of the 19th and early part of the 20th century. To revive old traditions lost during the Second World War and the Soviet occupation, six artists participated at a workshop held at the Siklós Ceramics Arts Center in southern Hungary in summer 2011. The aim of the workshop was to produce objects that would highlight Zsolnay's traditional role in producing high-end ceramics and demonstrate the compatibility of techniques like eosin glaze with contemporary art and design. 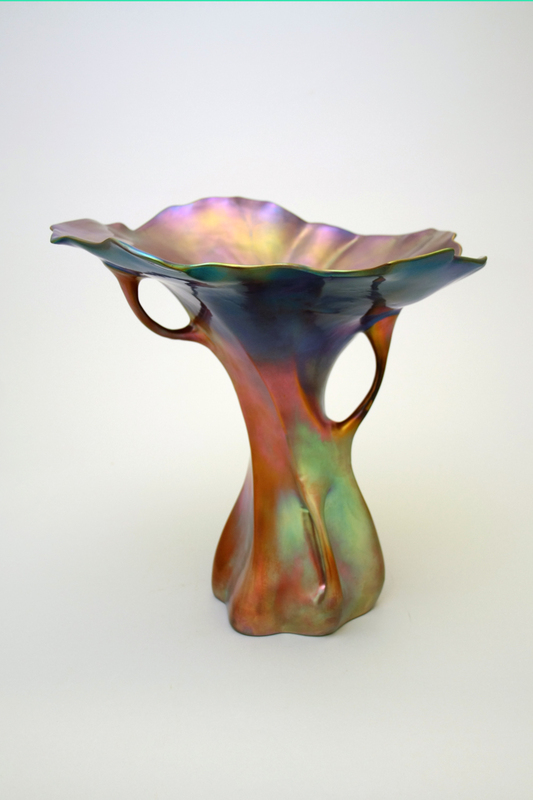 An express goal of the symposium: the presentation of those works in a special showing in New York City.The exhibition testifies to the unique reservoir of traditional techniques safeguarded at Zsolnay while showcasing the innovative potential for contemporary design highlighted by these iridescent and luminous glazes. 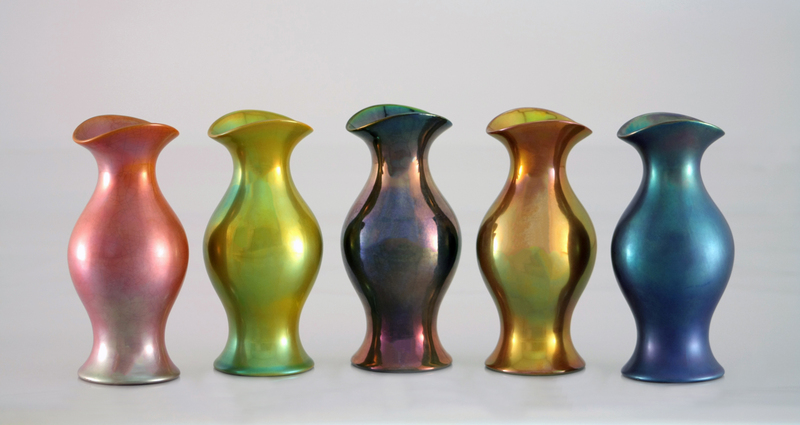 Of special interest are a series of vases by Eva Zeisel, which she contributed to the Siklós symposium in 2011. These were originally designed for Royal Stafford, and now enriched with iridescent glazes. Re-contextualizing some of her late-career trademark designs, on view will be examples of select forms designed by her in 1983 when she was invited to collaborate with the Zsolnay factory. These designs for eosin-glaze pieces were first executed in 1998 in a limited number. Artists include Viktor Erdei, a young designer at the Zsolnay factory, whose works re-imagine Art Nouveau in their invocations of natural forms. Sándor Dobány is an expert in architectural ceramic design, and creates fantastical porcelain objects painted with surreal imagery. Zsuzsa Füzesi's Whimsical Vessels series in eosin glaze investigate the geometries of structure and matter, and Edina Andrási’s experimental deconstructions of historical Zsolnay vases create objects that are both evocative of and radically different from their original sources. Finally, New York-based artist Julia Kunin’s recent pieces explore concepts of excess, growth, and decay, often bringing to mind memento mori. The works incorporate iridescent glazes, which change constantly with the light, creating psychedelic surfaces on the baroque forms. Apart from her contribution as artist, Kunin both proposed the show to New York City partners and co-curated the exhibition.